Why are the time-tested principles of respected 19th-century British educator Charlotte Mason so popular with homeschoolers? Because they work! 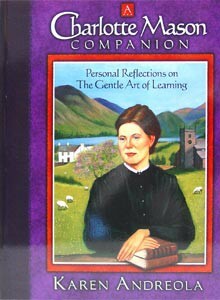 Karen Andreola shares her experiences in homeschooling the "Charlotte Mason way." Discover how to teach children to think independently, retain what they learn, and communicate clearly by narrating what they read in "living books." 384 pages, softcover from Charlotte Mason Research.